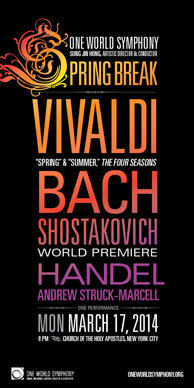 Thaw the last stubborn snow out of your boots with Vivaldi's effervescent “Spring” and scorching “Summer” concertos from The Four Seasons. Based on Philip Savage’s Infinity and poems by Kasenjo and Okyo, Andrew Struck-Marcell’s world premiere sings “a dream that vanish into flowers and moonlight.” The new Spring playlist heats up with Shostakovich’s Chamber Symphony No. 7, world premiere arrangement of the String Quartet No. 7 by Sung Jin Hong. Skip the plane trip — take your spring break with One World Symphony! Concert length approximately 85 minutes without intermission. Program may be subject to change.